The Oakland Asian Cultural Center is sponsoring a series of Asian cooking lessons with the idea of passing on these traditional foods to those who might not have grown up learning all about Laotian fresh bamboo soup or Thai green curry from their parents or grandparents. The OACC classes (which are supported by the Alliance for California Traditional Arts) put the emphasis on eating seasonally as well. For more info about the classes and how to sign up, click here. The latest class was on Vietnamese Banh Xeo eaten with fresh greens. Taught by Thy Tran of Wandering Spoon, it was a hands-on class on this classic, which is sometimes known as sizzling or happy sounds crepe or pancake for the sound the batter should make when it hits the hot pan. (You can hear the sizzle and directions here from Tran's website.) For a slideshow featuring highlights of the class, click here. Thy shared stories of her childhood, food experiences and her amazing mother, who taught her how to make this dish. She was determined to teach the process to us as she had learned it, by watching and then trying. She also passed on lots of tips that only experience can teach, everything from what products she found the best (see recommendations in the recipe) to tricks for peeling ginger and turmeric (use the side of a tablespoon). Then it was on to happy sounds; the sizzling of the crepe batter hitting the pans. Or, in some cases the not so happy sounds of students having to dump their batter out and starting over again because they used too much oil, too much batter or they started before their pans were hot enough. Thy had us frying in woks, an Indian dosa pan, a cast iron fry pan (class and Thy favorite), and a non-stick fry pan. The woks were the hardest to control, but created the most spectacularly large and golden crepes. When the bahn xeo better was about half way cooked in the pan, we added our own combinations of cooked mung beans, stir fried pork and/or shrimp, and raw mung bean sprouts. Then we let the crepes cook until they were golden, the edges browned and a spatula inserted underneath could lift the pancake cleanly. A quick flip of the spatula to fold the pancake in half, a slide onto the plate and it was ready for eating with dipping sauce and lots of Asian greens and red leaf lettuce. While there was a bounty of fresh greens around us, Thy was nostalgic for the really young and tender spring greens she has eaten these crepes with before, especially the ones her mother grows on her Midwestern property. We, her students, had to make do with the greens from the downtown Old Oakland Friday farmer's market (known for its Asian produce). It was a feast, and one we had all made for ourselves. We were the ones making the "happy sounds" as we devoured it all. Here is the recipe from Thy that we used. I made a very few changes based on my notes, but the recipe is not mine. This recipe is copyright Thy Tran and is used with her permission. 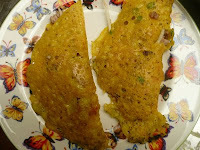 To grind the batter: In a blender combine the soaked, drained rice, coconut milk, scallion whites and turmeric root. Add about a cup of cold water and puree until rice is finely ground in a think batter. Drizzle in more water if needed to keep the mixture moving. It should look smooth, but still be a little coarse to the touch. Transfer to a large bowl and stir in additional water, if needed, to obtain the consistency of thick cream. Season to taste with the salt. (Can be refrigerated up to 3 days). Saute pork and shrimp separately in a small amount of oil in a hot wok or large skillet. Set aside. Boil the mung beans in water until al dente (about 20 minutes), drain and set aside. Scatter the bean sprouts, scallion greens, split mung beans and the cooked pork and shrimp over the crepe. Cook, uncovered, until golden and the edges are lightly brown. (Thy drizzles a bit more oil around the edges of the crepe to help them brown.) Fold the crepe in half and slide on individual plates. Serve with Asian greens, nuoc cham dipping sauce and pickled daikon and carrots (see recipes below). To eat, take a piece of lettuce or mustard green. Add in some of the herbs and vegetables and break off a piece of the filled crepe. Roll up the herbs, vegetables and crepe morsel inside the leaf. Dip in nuoc cham and eat. Wash and dry the greens and herbs. Put on platters with vegetables and serve with the crepes. 2 red Thai chiles, sliced thinly. In a glass jar, combine all with 1/4 to 1/2 cup water. Shake or stir until sugar is dissolved. Adjust to taste. Thy also served her crepes with some lightly pickled carrots and daikon. Here are her directions for making them. In a small saucepan stir together the vinegar, sugar, sale and 1 cup water. Bring to a simmer. Remove from heat, stir in the carrot and daikon and set aside to cool uncovered. Drain before serving. Refrigerate for up to 2 weeks. The crepes were also served with Rooster brand chile garlic sauce at the table for those who wanted to add a jolt of hotness to their experience. Thanks a lot. pickled carrots and daikon is an interesting recipe. At last I have found something interesting and unique to serve to my guests during the holidays. I am sure that they'll love this pickled carrots and daikon. thank you for shearing your post.